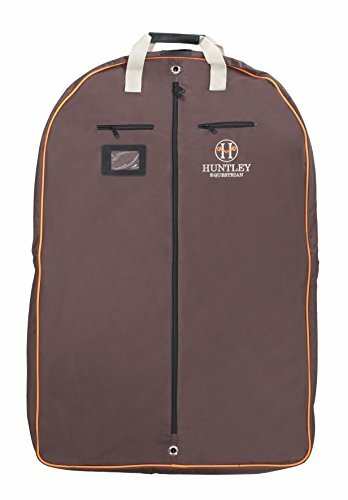 The Huntley Equestrian Deluxe Travael Garment bag combines high performance nylon with roomy features that can hold multiple coats, shirts, and breeches. Huntley's signature colors are brown with orange piping. Exterior features include 2 accessory zip pockets, card holder, and 2 durable straps with reinforced handles. Interior features include plenty of room for all of your equestrian clothes. A clear, small compartment hanging bag with a hoop feature can hold all of those small items needed for dressing for the ring. This garment bag will protect your valuable equestrian clothes and travels easy with the foldable feature. A beautiful finish to your traveling equestrian bag collection! If you have any questions about this product by Huntley, contact us by completing and submitting the form below. If you are looking for a specif part number, please include it with your message.